We haven't crossed too terribly much off the family bucket list this summer, but one thing we've done without fail: go out to a different ice cream shop every week. And not a Coldstone or Baskin Robbins either, but an independent, roadside type place. Without fail...and it's been awesome. But there's a problem. See, I like waffle cones, a lot. And the Good Lord, when I was born, decided to grace with a tremendous underbite that I have declined to ever get fixed. Surgically breaking and resetting a jaw and being subjected to a summer at home with Mom and Dad eating baby food during college when instead I could be off at campus didn't seem like fun. To help cover this up, and also because without it I look like a 14 year old with an hyperactive pituitary gland, I have grown a fairly large, bushy beard. The wife loves it and won't let me do more than an occasional trim. As a result, between my wacky jaw and crazy beard, it's impossible for me to eat an ice cream neatly. I've tried all sorts of different techniques...nope. It cannot be done. My three year old is neater than me, and we usually have to hose her off. Strangers gasp. Kids stare. Napkins cringe. It's bad. 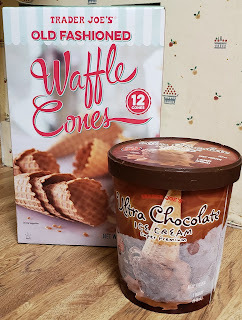 Fortunately, bettween Trader Joe's Old Fashioned Waffle Cones, and, say, Trader Joe Ultra Chocolate Ice Cream, I can contain my embarrassment at home. Waffle cones at first. A good waffle cone, in of itself, is one of life's simple pleasures. Why settle for one of those styrofoam type deals...when you can get a waffle cone? These TJ cones are no exception. They're appropriately thick and sturdy, with enough space to amply hold a couple scoops. That's key. When bitten into, there's lots of crunch-and-munch-ability, with little chance of these guys getting soggy. But then there's an added bonus: there's a sweet, almost creamy, vanilla flavor shining through the batter that adds a really nice little touch. Really, these are pretty greta cones, and at $2.99 for a dozen, not a bad deal. Most ice cream shops charge what, an extra 50 cents (at least) for a waffle cone? These are 25 cents each! Nice! As for the Ultra Chocolate Ice Cream...meh. It's decent ice cream, don't get me wrong. But chocolate by itself doesn't quite get my motor running. That being said, the TJ's chocolate ice cream is better than average chocolate. The cocoa flavor is rich with depth and is fairly potent, more than a typical chocolate. It's probably a good thing there aren't any mix-ins or added flavors as they would probably be overpowered. And from seeing how hard this ice cream freezes, it's made from good quality ingredients too. Lots of milk and cream and eggs and the like. In all, pretty good, even if it's not all my thing. If you're a chocoholic, though? You'll be all over this. The waffle cones will be a summer staple, for sure. We do ice cream far more than we should at home...it's hot and we ahve no AC and get tired and cranky easily. Don't judge. As for the ice cream? It'll be in and out, I think. Neither Sandy nor I are huge fans but our kids sure are, and by God, if it'll help them eat anything other than mac and cheese for dinner, we're for it. Waffle cones earn near top marks, while the ultra chocolate ice crwam comes in a little behind. I think the waffle cones can be used in so many approaches! Homemade drumsticks dessert! Crush it up and use it in chocolate bark. Use it for fruit salad for texture. Finally TJ's is getting on the waffle cone trend. I hope they do a cookie butter cone! That would be amazing! Using the same mixture but make it slightly thinner and then form in cones. Sugar cones have always been my favorite! I always ask for the ice cream in a cup with the cone since no matter what half the ice cream drips out the bottom or melts down the sides..
are these really large? Waffle cones in ice cream shops seem to be ginormous. I think we have some of the best ice cream on the planet! Well, that you can buy at a grocery store, that is. Our mint chocolate chip ice cream is RIDICULOUS. If only we didn’t do away with my all-time favorite, the lemon triple ginger snap ice cream. Good freaking Lord, I could have taken a daily bath in that stuff. Thanks for the review! Love reading all of them. We discovered TJ's waffle cones and chocolate ice cream about a month ago, and our family has been enjoying them ever since. As a lover of chocolate ice cream, this TJ brand is an excellent version - I'd say one of the best grocery store chocolate ice creams out there.